Abstract. Terrestrial water variables are the key to understanding ecosystem processes, feed back on weather and climate, and are a prerequisite for human activities. To provide context for local investigations and to better understand phenomena that only emerge at large spatial scales, reliable information on continental-scale freshwater dynamics is necessary. To date streamflow is among the best-observed variables of terrestrial water systems. However, observation networks have a limited station density and often incomplete temporal coverage, limiting investigations to locations and times with observations. This paper presents a methodology to estimate continental-scale runoff on a 0.5° spatial grid with monthly resolution. 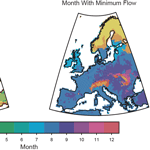 The methodology is based on statistical upscaling of observed streamflow from small catchments in Europe and exploits readily available gridded atmospheric forcing data combined with the capability of machine learning techniques. The resulting runoff estimates are validated against (1) runoff from small catchments that were not used for model training, (2) river discharge from nine continental-scale river basins and (3) independent estimates of long-term mean evapotranspiration at the pan-European scale. In addition it is shown that the produced gridded runoff compares on average better to observations than a multi-model ensemble of comprehensive land surface models (LSMs), making it an ideal candidate for model evaluation and model development. In particular, the presented machine learning approach may help determining which factors are most relevant for an efficient modelling of runoff at regional scales. Finally, the resulting data product is used to derive a comprehensive runoff climatology for Europe and its potential for drought monitoring is illustrated. How to cite: Gudmundsson, L. and Seneviratne, S. I.: Towards observation-based gridded runoff estimates for Europe, Hydrol. Earth Syst. Sci., 19, 2859-2879, https://doi.org/10.5194/hess-19-2859-2015, 2015. Water storages and fluxes on land are key variables in the Earth system. To provide context for local investigations and to understand phenomena that emerge at large spatial scales, information on continental freshwater dynamics is needed. This paper presents a methodology to estimate continental-scale runoff on a 0.5° spatial grid, which combines the advantages of in situ observations with the power of machine learning regression. The resulting runoff estimates compare well with observations.